Battle of the Hydaspes River (326 B.C.) - After the fall of Persia, Alexander wanted to keep going. India was known in the West at that time only from rumors and he was anxious to see it for himself. The bulk of his army pushed through the Khyber Pass, though Alexander himself may have taken a small contingent through a more rugged northerly route, and captured the natural rock fortress of Aornos (kingdom unknown, though of an Indian affiliation). He followed this path because legend had it that the Greek hero Hēraklēs traveled the same route during the Heroic Age, but failed to capture the fort. By doing so, Alexander wanted to demonstrate that he was even greater than Hēraklēs. It was here that some of Alexander's men reported seeing great serpents (dragons) living in caves. After crossing the passes and entering into the Punjab region, the two Macedonian forces reunited and reached the Hindu Paurava kingdom, ruled by King Porus. Naturally, Porus considered the presence of a foreign army in his land an invasion and marched an army to head off Alexander's. They met at the Hydaspes River (modern Jhelum), a tributary of the Indus. The Macedonians were on the north bank of the river and Porus waited for him on the south. The Hydaspes was a deep, fast moving river and Alexander knew any attempt to cross and engage Porus would be dangerous. So he marched up and down the bank looking for an opening, but Porus mirrored his every move. Finally, Alexander took a small force and snuck away at night while the bulk of his army remained at camp, leaving Porus to believe the Macedonians were still waiting on the opposite side. He left his general, Craterus in charge of the main force with orders to cross and attack if the Indian army had discovered their ruse, while he headed upstream. Porus did discover the plan and sent his son with a small force of his own to prevent the crossing. But they were too late. Alexander had already forded the river and easily routed the Indian contingent, killing Porus' son in the skirmish. Porus learned of the defeat and took his strongest units to meet Alexander leaving a smaller force to try to prevent Craterus from crossing. But before he arrived, Alexander had another surprise in store. About a thousand of his cavalry, under the command of general Coenus separated from Alexander and rode off into the forest, out of sight of the Indian army. When Porus approached, the two armies arrayed their forces in a line perpendicular to the Hydaspes. Alexander began to march forward and showered Porus' left flank with arrows. He then personally led his cavalry into this flank to try and break it. As Porus moved his line to it shore it up, Coenus and his cavalry suddenly appeared and attacked from behind. The Indian army was now being assaulted from both sides. 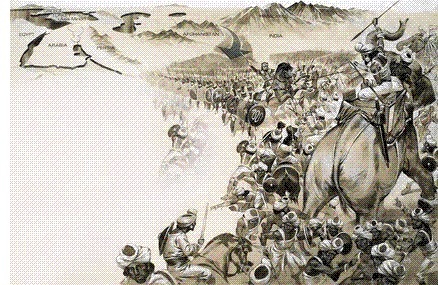 Porus tried to maneuver his troops around to defend against the rear attack, but a large number of his mounted units consisted of war elephants, and their size was as a detriment to this type of maneuver. The Indian line became chaotic, and the Macedonians gained the upper hand in the battle. Word of Porus' troubles made it back to the Indian camp where the reserves were keeping Craterus in check, and they raced to the battle to aid their king. This provided Craterus with the opportunity to cross the river and ultimately join the battle as well. 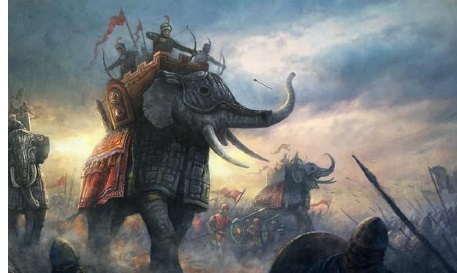 It was a hard fought battle and despite the confusion, the Indian elephants wreaked havoc on the Greek phalanx, nearly breaking the Macedonian line. But it held, and in the end, the invaders won the battle. One of the casualties though was Alexander's horse, Bucephalus. Alexander founded two cities on the river. On the battle side, Nicaea (Greek for victory), and on the other, Alexandria Bucephala in honor of his faithful steed. Porus' army was not annihilated, he surrendered when it became clear he would not win. He had earned Alexander's respect, whom he regarded as his toughest opponent, and Alexander made him satrap, essentially allowing Porus to keep his position. After Hydaspes, Alexander wanted to push even deeper into India. The neighboring kingdom was the Nanda Empire. It was even larger and more powerful than the Paurava and word had reached their king, Dhana Nanda, of Alexander's approach. In return, word reached the Macedonians that Dhana Nanda was assembling a massive army to meet the foreign threat. After eight long years of battle and a near defeat at the hands of Porus, Alexander's men revolted and refused to go any further. He relented and agreed to turn back. Alexander died three years later in Babylon.